Topeak quality and versatility. 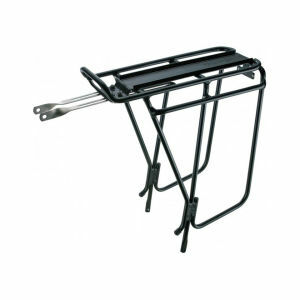 Super strong yet light tubular aluminium rack with integral top plate and triple stays. Integral Quick Track accepts all Topeak Trunk bags. Designed for use with frames using disc brakes. Designed to fit frames with disc brakes. I love the pannier rack and bag. The,rack was very easy to install. It fit over my disc brakes. The Topeak bag is great quality. It slides in and out of the,rack to be very stable during the ride. Very please with this product. This rack is for my Cannondale CAADX and fitted onto it without any drama. I used an aftermarket seatpost collar that incorporated threaded holes for the upper rack bars to screw onto. The disc specific model has rectangular blocks at the base which flare the lower portion of the rack out ensuring plenty of clearance from the disc. I have tried the non-disc specific model on my bike and it fits perfectly too - just with a much narrower appearance / profile from behind. I bought this for my commuter and it works well with Ortlieb rear panniers. Fits nicely with rear disk braked bikes, just watch cable placement upon installation. It does suffer from a bit of rub from the panniers - slow wear and tear. You can fit a rear light/reflector, the Topeak branded ones are pricey and not that effective. Installation of other rear lights can be fiddly since most are made with seatpost clamps and require "customisation" to anchor to the back of this rack. Lastly, the price is great for what you get and it doesn't weigh a tonne. This is the best rack I have ever had. Super solid, rigid construction. A lower level rail means the panieers can attach lower down the rack, helping to reduce your center of gravity for those big hill climbs. The spacer bars that hold the rack away from your brakes and gears have a deep set attachment point so the bolts can be short reducing the chance of that dreaded bolt snap situation. It fitted my 29 inch touring wheels perfectly. This is by far the best rack I have ever come across. I have struggled for a couple of years using an old school rack, my panniers have fallen off and hit the breaks etc etc. But this to peak rack is perfect. It has solid,ridgid but light construction. Easily fitted my 700c frame. The welded spacers to allow for disc breaks and gears have the mounting screw set deep inside making it much less likely to snap the bolt under load. And the low mounting options for the paniers on the side reduce your center of gravity considerably making those big hill climbs a breeze. A 5 star rack for sure!! The Topeak rack arrived promptly from ProBikeKit in good condition. Easy to fit to bike. Seems quite strong but would prefer it if welded both sides on the top rail. This is a well built rack, but has some sharp edges. It was quite pricey, but holds pannier bags well. Standard seat postrear lights do not attach easily, you need a flexible rubber strap style mount. Makes sure you use threadlock too. Good for commuting. I think this item maybe very good but at AU$16,264.37 it might be a little overpriced. PS No I don't expect you to publish this.